When it comes to fence supply in Gwinnett County, GA, we want to be your go-to company. We make getting fence supply ordered and delivered to your doorstep as simple as possible. Browse our online fence supply store to choose from beautiful styles of aluminum, vinyl, and chain link fencing and with a few clicks, it’ll be on it’s way to your home or job site. Don’t see what you’re looking for? Give us a call or send us an email to discuss your fence supply needs further! Looking for fence or gate repair in Gwinnett County, GA? Fence Workshop provides superior repair services for all types of fencing and gates throughout Gwinnett and other metro Atlanta areas. Whether you have a commercial chain link gate that has been hit by a delivery truck, or a wood privacy fence that has been damaged by a falling tree, Fence Workshop can get your fencing and gates back to working order and looking even better than before. Want a quick quote for your repair? Send us photos of your damaged fence or gate to info@fenceworkshop.com, and we’ll get a quote back to you in no time. Looking to add a driveway gate to your home or business? Fence Workshop wants to be your choice for both supply and installation! While we no longer offer full fence installations, we now specialize in gate installations and automation! 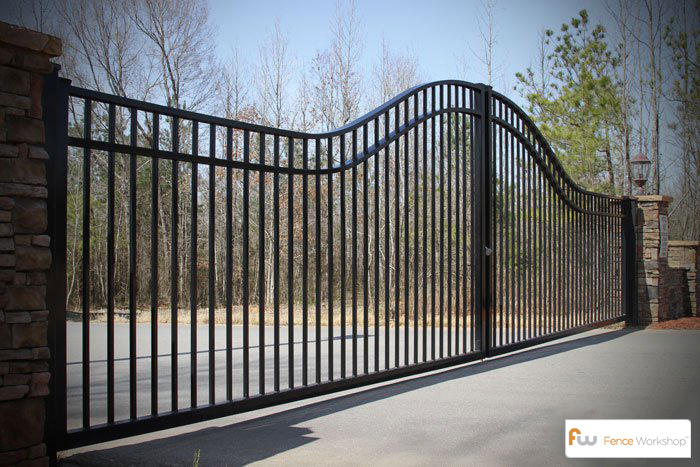 We’ll get you a great price on a beautiful new aluminum or steel gate for your property, adding elements of both security and beauty to your home or business. Give us a call today to talk to a Fence Workshop representative today about pricing and style options! Ready to purchase high quality fencing materials? Our easy-to-use online shop makes purchasing beautiful new fencing a breeze! Browse our selection of fences and with just a few clicks, your new fencing can be delivered to your doorstep. We can’t wait to work with you!